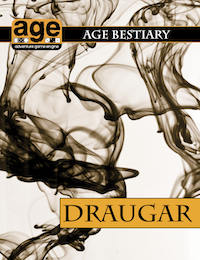 Today we present a new product for the AGE System (the rules that power the Dragon Age RPG): Draugar. The latest AGE Bestiary has arrived! Writer Byron Molix and Developer Jack Norris take to the frozen barrows and icy waters of the North to bring you the menace of the draugar. Restless murderous undead returned to torment the living, the draugar are a great resource for any GM looking to add some new threats to their campaign. In addition to several examples of various draugar, this product includes a template for creating your own undead monsters and customization options for the included monsters. Ronin Round Table: Back Issues Ronin Round Table: New Game Store!